The Ones We’ll Miss, (the way the war comes home): Andrew Olmsted/Thomas Casey chapter. A brief essay of loss, followed by an address to which readers can send help below. Look down this post even if you don’t care to read what comes in between. The blogosphere, left, right and apolitical, has been in general mourning over the death of Major Andrew Olmsted, who blogged under various names — his own, until the army censored him; G’kar and Sheridan. He was, I think, best known for his writing at Obsidian Wings, and also blogged at All Alone in the Night. He also wrote for the Rocky Mountain News — and along the way, served with distinction as an officer in the US Army in time of war. You can read Major Omsted’s last blog post here. As for who Thomas Casey was — read on. I’m a latecomer to the blogosphere, and I never had any interaction with G’kar — which is the name I knew as the blogger posting really good stuff over at Obsidian Wings. Military bloggers are one of the best things to come out of this miserable war; they help close a gap that cannot be allowed to widen between the uniformed services and the American people and polity. For that work, I admired Major Olmsted without ever knowing who he was. Now, of course, I will not have even the blogospheric connection to Major Olmsted that others more precocious than I are mourning now — read this for an example of such memorials and go here for links to an enormously impressive list of those who wanted to remember a friend, whether known through real or virtual contact. As usual, you only find out that you miss someone you never knew when others who had the luck and wit to make the connection in life tell you so. In the latest impressive display of grace from the Olmsted family, the response to a broad based desire to do something to remember Maj. Olmsted — G’kar — came out today. In it, the family asked the blogosphere so moved to do something not for them, but for the four children left by Captain Thomas Casey, Andrew Olson’s subordinate, who was killed trying to help him. I’m writing a check. The address follows — and it contains the reason that I was moved to write a piece about two men I never really knew existed until a few days ago. Nobody knows about the town of Chester, California, and those of us who do (ignore the logic) like it that way. When I first came to Chester I was almost six; more than four decades later, it is still as much the place I think I’m from as the town I grew up in and the one I live in now. Back in 1966, it was a small logging town — Collins Lumber, a model of how to run a timber business, still has its mill going there. A few ranches raised cattle around the area, and the nearby national park brought in a few visitors, but Lassen Volcanic is still the least visited of California’s major protected wild places. Chester has grown now, and has become something of a vacation and retirement destination, but it’s still a little place, a beautiful place, a surprisingly secret one in what was once called the uninhabited quarter of California. And the town cares about its own. My mother was a summer person there, but she’d worked her way into its fabric over forty years. On the night she died, she got the last phone call she ever took from the woman who runs the fountain counter at Lassen Gifts, who’d know mom since the beginning. Joan had heard Mum was seriously ill down in the big city, and she had to check in. They chatted briefly, Mum told a joke, and said good bye. I never knew Captain Casey. I don’t know a thing about him. I’m sure I’ll hear more — probably a lot more, when I go up to Chester this June, for my annual trip. But this time, for the first time in the four years of war, I know I lost a kind of neighbor. It should not take this kind of connection to feel loss. It doesn’t always. One of the reasons I have hated this war from the beginning has nothing of reason in it. I lost my father to an accident when I was ten. Ever since, when I hear of a father or mother leaving their kids behind, or a son or daughter lost to parents, I wince with remembered, reflected pain. And so, for the last four years, I’ve felt that twinge every time the newspaper prints a picture or two and adds a paragraph or so. Andrew Olmsted, with grace, asked that no one politicize his death, and I won’t. I don’t claim that that part of my reaction to the war is anything like enough to form a reasoned argument for or against. It’s just there. But it is true that when there is any line of connection, that wince becomes something deeper, something internal to the way the world seems that day. Andrew Olmsted has those who knew him to mourn him with all the honor his life and work have earned him. Of Captain Casey all I can say is that I know that he left a truly special place to do his duty far from his family and the beauty of his home. I’ll remember that about a person I never met for that. Update: For details on Thomas Casey’s connection to Chester, see this article from the home-town newspaper, the Plumas County News. (Not quite the true local paper: that honor goes to my favorite weekly, the Chester Progressive.) Turns out that the Casey family tie goes through his wife, Leslie Ann Casey, born and raised there. The end result is the same: war comes home not in the big headlines, but in the subtle, sideways facts that create a bond of feeling that goes deeper than any abstract understanding of loss. Update 2: typos corrected to replace the fictional Andrew Olson with the actual Andrew Olsted, also to replace a few missing verbs. (Verbs? We don’t need no stinking verbs!). The moral of this correction: don’t blog while virally enhanced. 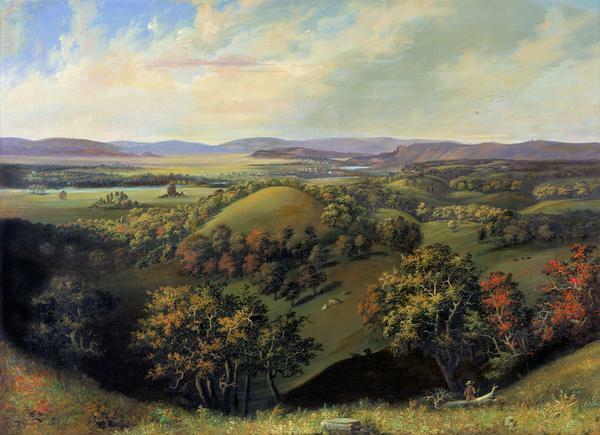 Image: Samuel Marsden Brooks, “Wisconsin Heights Battlefield.” Source: Wikipedia Commons. The battle of Wisconsin Heights in 1832 was the second to last engagement in the Black Hawk War. It is mostly forgotten now, as most engagements become after the children or the grandchildren of those who fought them are no longer there to remember. But still: people fought and died there. This entry was posted on January 8, 2008 at 5:56 pm and is filed under memory, War. You can subscribe via RSS 2.0 feed to this post's comments. You can comment below, or link to this permanent URL from your own site.